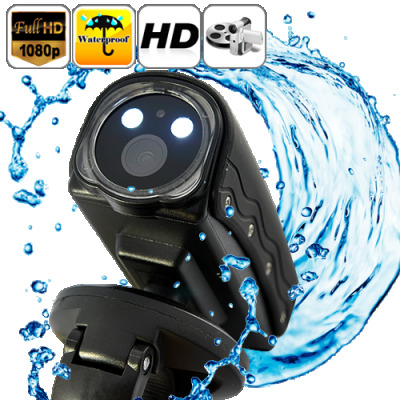 Successfully Added Mini HD Sports Camera (1080p, 20 Meter Waterproof, LED + Laser Light, HDMI) to your Shopping Cart. Extreme sports takes you to extreme weather conditions and wild environments... but you can't make a record of it to share with others because your brand name camcorder can't stand the heat. Well, here is the solution: a waterproof high definition wide angle sports camera able to store up 32GB of videos and images that is suitable for most places and activities such as riding, climbing, motocross, skiing, surfing, sail boarding and even diving! Designed with a beautiful sports form factor, mini size and light weight, this tiny camera is resistant, durable and waterproof! Provided with bicycle handlebar mount, it will help you to set it easily on your equipment and thus enjoy activities hands free. Shoot the rapids, make the show with your mountain bike, swim in the middle of hungry sharks and this awesome camera will capture every second without worrying about impacts and jaws! Once you have recorded enough crazy moves and sequences you will be agreeably amazed to admire stunning full HD 1080p video and ultra vibrant colorful photos! To extend pleasure, the camera has both a laser light and LED light to allow you to record during night time and in dark areas. Diving underwater and exploring becomes even more exciting! This awesome HD camera is no more than perfect for sports lovers. Check how much we offer it and catch this opportunity before others clean out our stock. Once again all this is brought to you by the online leader of electronic products, Chinavasion. Waterproof up to 20 meters! Waterproof: IP68, waterproof up to 20 meters! I bought this camera to use when kajaking and when flying my R/C plane in FPV mode. The quality of the films are breathtaking and the cize and form of the camera suits my needs perfectly, so thank you for a good handling of my order. on 2012-03-24 01:28:25 Very good camera! I use it for aereal photography from a model airplane. It takes sharp, smooth videos with 60 fps at 720p, which is perfekt. The wide shooting angle is another big plus. Recommended! Just coming back from family vacation at Punta Cana. Took great sharp photos and videos. It floats, thats great too. Sound record is a little low.